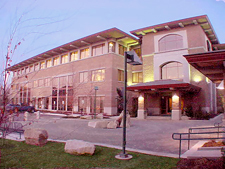 AMRESCO Commercial Finance, LLC ("AMRESCO"), headquartered in Boise, Idaho, has been in the commercial loan servicing business for over 25 years. During this time, AMRESCO has been responsible for servicing over $3.5 billion of commercial loans in all 50 states for banks, hedge funds, insurance companies, specialty finance companies and other portfolio lenders. Many of the loans serviced by AMRESCO have been securitized through Rule 144-A transactions. AMRESCO also provides special servicing, back-up servicing, private-label servicing and asset management for our clients. AMRESCO provides loan servicing for performing, non-performing and sub-performing commercial loans of all types, including, senior secured loans, revolving lines of credit, loan participations, subordinated loans, unsecured loans and mezzanine debt. AMRESCO services loans in all industry sectors, including, commercial, industrial, retail and residential. AMRESCO has extensive experience servicing a diverse portfolio of commercial loans, including loans secured by commercial land developments, residential land developments, raw land, office buildings, hotels, motels, apartment buildings, assisted living care facilities, trailer parks, franchised and non-branded restaurants, convenience stores, health clubs, car dealerships, car washes, funeral homes and automotive service centers, just to name a few. AMRESCO's Master Servicing Department has broad experience in invoicing, automated clearing house ("ACH") payment administration, cash management, payoff calculations, escrow and reserve account management, investor reporting, tax, insurance and UCC tracking and administration, financial reporting and loan covenant compliance, loan assumptions, collateral swaps and lien releases. AMRESCO's Special Servicing Department specializes in servicing and providing asset management services for non-performing, sub-performing and other troubled loans as well as real estate owned ("REO") properties throughout the United States. Over the years, AMRESCO has built a superb team of asset managers, attorneys and other professionals with extensive nationwide experience in the management, resolution and disposition of troubled loans and REO properties of all types. AMRESCO is dedicated to out-performing our peers and achieving the highest recovery rates in the industry. AMRESCO's Loan Acquisitions Group: Leveraging off our talented Master Servicing and Special Servicing Departments, AMRESCO established a Loan Acquisition Group to purchase performing, sub-performing and non-performing secured and unsecured commercial loans directly from lenders and holders in the secondary market. AMRESCO will purchase a single loan or pools of commercial loans originated throughout the United States with principal balances between $1 million to $400 million. AMRESCO purchases troubled loans of all types, including delinquent loans, defaulted loans, accelerated loans, those operating under forbearance agreements or loan modifications, and those in various stages of bankruptcy or foreclosure. See our Loan Acquisition Fact Sheet for further details. ... provides master servicing, special servicing, back-up servicing, private label servicing, asset management, and investor reporting at affordable rates. ...professionals are extremely experienced in dealing with cash management functions, collateral and compliance monitoring, bankruptcy and foreclosure proceedings, and other loan workout strategies.